A mod adding more difficulty to the game as well as game enhancement features. Ability to increase defense rating of enemy islands to provide more challenging gameplay. Ability to manually enter timewarp at the press of a key. Ability for enemy carrier to respawn some time after being destroyed to provide additional challenge and opportunity to defend your islands. Ability to take manual control of AI mantas and walruses on friendly islands for an additional method of defending your islands. Ability to disable the automatic resuming of a unit's program when you switch from manual control to another unit. This prevents units wandering off without being instructed. Improved docking ability for mantas which allows them to fly a straight line to the carrier instead of using the AI which can take some strange routes. Overdrive allows them to speed boost away from incoming fire during docking. They can also dock on a moving carrier. Two-stage radar upgrade. The first stage gives you early warning of the enemy carrier's presence at any of your islands and the second stage gives you full monitoring of the enemy carrier's movements. Scout drone can be re-docked to the carrier instead of being single-use and can also be manually controlled and has an additional camera with two-level telephoto zoom. Ability for mantas to refuel and repair walruses and vice versa at the expense of their own fuel. Ability for walruses to self-repair at the expense of fuel. Carrier fuel management system allows onboard repair and refuelling of units to be done at the expense of carrier fuel, and allows the carrier to refuel at island piers. Advanced tech items including laser and rocket weapons for the carrier, upgraded laser for mantas and shield module for walruses. 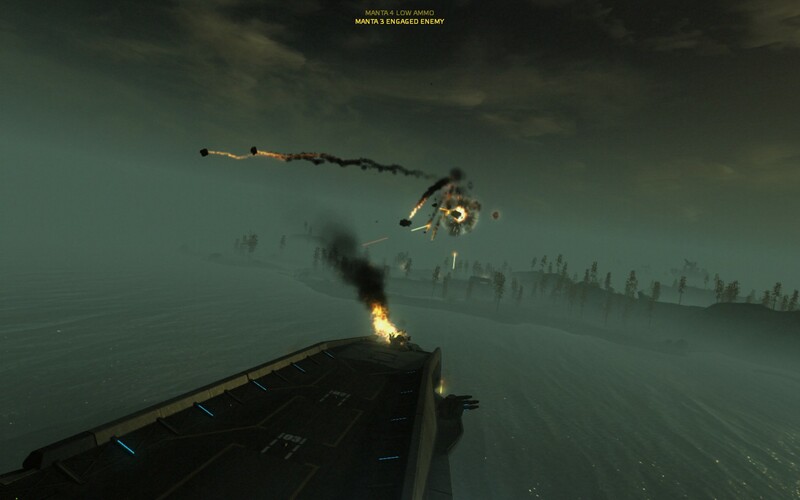 Electromagnetic flares for the carrier allow enemy carrier functions to be temporarily jammed. Position holding and dynamic stance options for mantas increases their potential in battle without allowing them to wander into heavy fire when under AI control. Ability to disable the repetitive warnings from the bridge crew about fighting in bad weather or on heavily defended islands, and explanations about island missions every time you arrive at an island. Various tweaks and improvements to game mechanics and interface, including new camera angles, ability to set the weather intensity, switch off the HUD for screenshots, remove the animated bridge background on the map screen. 3. The mod can be applied to an existing savegame, but the islands will only remain deadly as long as you play with the mod enabled. If you disable the mod later and resume the game, the islands will return to their initial rating. I recommend you make a backup of your savegames to be safe. 4. This is mostly meant for the strategy game, I have not tested it during campaign. 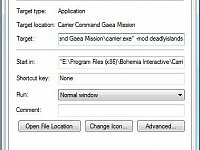 To find the location where you need to unzip the zip file to: go to the Library tab in your Steam client, right-click on Carrier Command: Gaea Mission, click properties, click the Local Files tab, then click Browse Local Files. This is the location where the deadlyislands folder should go. You will need to have the latest beta version (1.07.0025). To ensure you have the latest beta, go to the Library tab in your Steam client, right-click on Carrier Command: Gaea Mission, click properties, then betas, then set the drop-down option to "Opt into beta version of the patch". If you do not like all aspects of the mod, it is fully customizable using the in-game menu. - Requires CCGM 1.07.0023 beta. If you are still running CCGM 1.06, you should continue to use v1.15 of the mod instead. - The new items will only be unlocked at the start if the game was started with max initial technology, otherwise they will be unlocked as progress bonuses as the game progresses. There is also a chance to unlock them by hacking research facilities. - Laser and rocket carrier guns will also be available to the enemy carrier once you have them onboard. - The "power" indicator bar for the new weapons is not a true indication of their power. They are more powerful than the bar suggests. - Due to the additional items in this update, games saved with the mod running will no longer be compatible if you remove the mod. If you are just trying out the mod, it is recommended that you make a separate save file that you can resume from if you choose to remove the mod. Thanks to Rob04 for playtesting. Thanks to the dev team for including my request in the last beta, which was key to making the fuel management system possible, and Rob04 for continuing to help with playtests. Thanks to Newtie for making the database tool which made the gun angle improvements possible, and to Rob04 for continued playtesting and reporting issues. ---With level 2 tactical scanning, the scout drone can now also communicate targets to you when you are not in the map screen. A list of targets will appear on the left side of the screen and will also show their current damage level. The list will automatically sort by distance from your currently selected unit. Clicking on a target in the list will cause any selected units to attack the target. Clicking while the carrier or scout drone is selected will tag the target instead and it will remain tagged when you switch to any unit. To select an item when the scout drone is selected, hold the right button and move the mouse up or down. The drone camera will focus on the highlighted item. If a target has been tagged, pressing the left button at any time will focus the drone camera on the tagged target. Note that targets must be flagged as being in line of sight, so you will need to switch to either the map or the scout drone to be able to see updated targets if the drone has been moved to a new location by waypoint. There are two customization options for this feature, the first option allows you to select the maximum number of nearby targets to display in the list (Only when a unit is selected. The carrier and scout drone will always display the maximum amount possible for your screen size). The second option allows you to select the update frequency for the target list. By default this is set to once per second. You can increase this to maximum (about three updates per second) for faster response, but performance impact will be greater. ---With level 2 tactical scanning, the scout drone will now be able to continue the tactical scan function for a short distance from the carrier when it is docked. This applies to both the information displayed on the map screen and the target list in fullscreen. ---When at an enemy island which has another enemy island in close enough range, the other island will send waves of long range mantas to attack your carrier at random intervals. These will approach from a position offshore from your current island and behind you relative to the island. The quantity and loadouts of these mantas will depend on the defense rating of the strongest nearby island. When these mantas run out of primary weapon ammo, they will flee across the island. 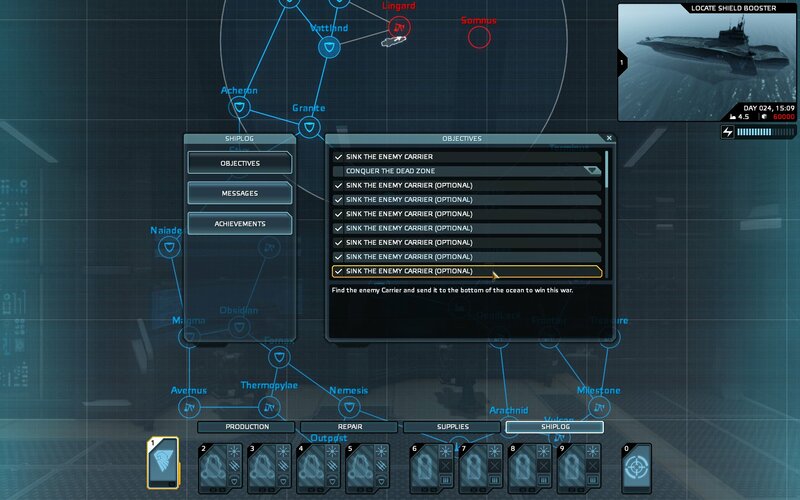 Note that these mantas are only intended to cause damage and will not be able to destroy your carrier by themselves. There is a customization option for this feature if you prefer not to have it (feature requested by nicoman). ---When the supply barque is about to arrive, you will be able to actually see it surface behind the carrier and move inside the docking bay. If the main carrier button is selected and the carrier is not moving, a new camera angle will show this docking sequence. A message will tell you that the barque is arriving when this sequence starts. ---When defense drones are launched, they will now launch from the drone bay at the back of the carrier before moving to their positions. When the dock button is clicked, they will move to the back of the carrier and then dock into the drone bay. 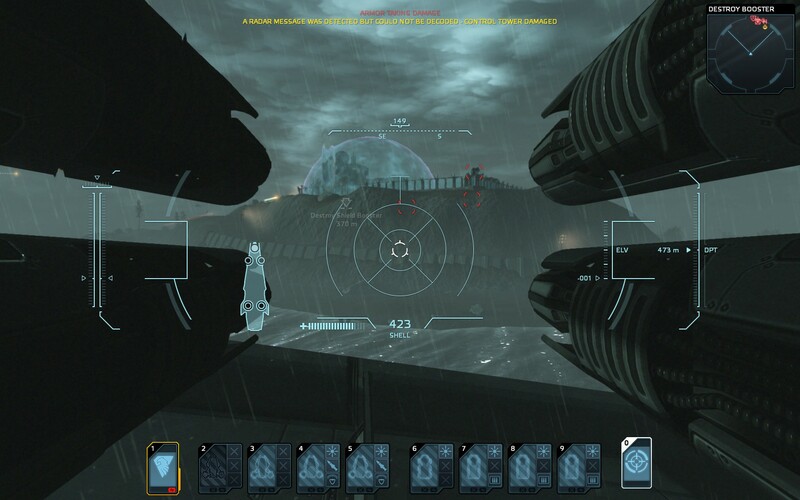 If the carrier weapons button is selected, a new camera angle will show the launch and dock sequences. ---An item on the quick options page of the customization menu now allows you to choose from various formations for the defense drones, including a formation that will always keep the drones between the carrier and the island, regardless of the direction the carrier is facing. ---Defense drones have had their damage output and armor increased slightly. They will now also slowly self-repair up to a certain level if their damage is not too great, and their damage level will now show when pointed to in the map screen. ---When a manta has rockets or missiles equipped as well as an additional weapon in the first slot, you can now turn off the ability for the AI to fire them. To do this, click the missile/rocket icon within the unit's command bar icon. To avoid accidental clicking when selecting units, you will need to hold down the left button for a short moment when clicking the missile or rocket icon. A small red cross will indicate that the missiles are disabled. As a safety precaution, this will be overridden if the main weapon runs out of ammo or the unit is damaged. In this case, the red cross will turn yellow. This function is intended for situations where you have a heavily armored/shielded manta fighting weaker targets and do not want the AI to waste missiles/rockets. ---In the unit equipment screen, you can now set a default preset for each unit. When a unit is destroyed and a new one is transferred from storage, the default preset will be applied. A message will now appear when a new unit is transferred from storage, and which equipment preset has been loaded, if a default is set (requested by faber42). ---Unwanted items on the stockpile island can now be reprocessed back into materials using the advanced production screen. Any item on the blueprint list that has a quantity on the stockpile island will have a column with a red cross. Clicking the red cross will recycle one of the items into material, as long as there is enough space for the amount of material to be added. The current maximum material amount will now be shown in brackets under the current available material amount. Reprocessing efficiency is 85%, so you will get 85% of the original material cost of the item. ---When a walrus gets stuck against a tree, rock, unit wreckage etc., it will now be able to pass through the item that is in the way. This will reduce the problem of walruses getting stuck on these items. ---The enemy carrier will no longer automatically get upgraded with lasers and rockets when you have them available on your carrier. Instead, it will receive a one-level upgrade to one gun at a time for each island that it conquers, but only up to a level that matches your highest level of weapons. This will make it possible for the enemy carrier to fight using more varied combinations of guns (requested by faber42). ---The drone door will now open during launch and docking of the drone. ---Pressing the drone shortcut key when no drone is active will now launch the drone. ---Island mantas and walruses will now be shown on the map with the correct icon for their armor level. ---Added an option for enemy carrier hardening. This will give each of the enemy carrier's systems extra armor which will absorb a certain amount of damage before the system itself starts taking damage, therefore making the enemy carrier more resilient in battle. By default this option is set to 10%. I recommend you try it out at this low level before going higher. This option can also be disabled if you prefer not to have it. ---Added carrier damage report display. When any of your carrier's systems take damage, a small health bar will slide out on the right edge of the screen. By default, these bars will always be displayed for any damaged systems and will disappear once the system is repaired. When a system is being repaired, its bar will turn blue to indicate that repair is taking place. There is a cutomization option if you prefer only to have the bars display for a few seconds each time damage is received, or if you prefer not to have this at all. ---Added new item, the drone tactical scanner. Production will unlock after production of the scout drone has been unlocked. Once this has been produced and sent to the carrier, the scout drone will be able to detect the items fitted to any enemy unit within scan range, as well as the type of any turret and damage level (if any) of any unit, turret or building. This information will be displayed when you point to the unit on the map. You can fit up to two of these scanners, the first will give basic short range scanning and the second will triple the range. If you lose a scout drone, you will also lose one scanner. ---The same information displayed by the drone tactical scanner will be displayed for all friendly units, turrets and buildings, including your carrier units, without the need for the drone or scanner. ---Added a hotkey so that you can switch to the previously selected unit. By default, this is bound to the backspace key. There is a customization option so you can change this if you prefer. ---You can now manually control turrets on friendly islands by clicking on them on the map. ---Carriers can now be displayed on the radar when you are outside the normal range. This can help give you a fixed point of reference to avoid losing your bearings and getting lost on an island. Note that these longer range icons will be displayed relative to the unit's orientation regardless of the rotation of the radar. There is a customization option if you prefer not to have this feature. ---Added an option to have an additional display of a unit's armor level within its command bar button. There is a customization option for this function if you prefer not to have it. -Piers, refuelling stations and research stations no longer need to be activated by pointing to them on the map. -Scout drone no longer needs to be manually selected after launching for it to be detected. -In the advanced production screen, items in the queue can now be moved by dragging. -The player's icons on the map screen are now a slightly darker shade of blue to allow the white icons of currently selected units to be seen more clearly. - Mantas can now dock while carrying a walrus on a hook when the manta simple docking option is enabled. When the manta reaches the carrier, the walrus will be released and will also dock. Note that the verbal message will still play, saying that the manta cannot dock with cargo (feature requested by faber42). - Pressing the dock key while a hooked walrus is selected, the dock command will be given to the carrying manta instead. - When using the walrus navigational enhancement option and commanding a walrus to activate or hack a building using the map, the walrus will no longer lose the ability to automatically activate or hack the building when it gets there. - When a walrus is commanded to activate or hack a building using the map, its program will automatically be cleared when it reaches the building. This will prevent false alarms when using the walrus stuck alerts option and will also allow the walrus to enter offensive stance when the dynamic stance option is enabled. - When using the walrus stuck alerts option, if a walrus makes no movement at all, for example if it is given a waypoint that cannot be calculated, the stuck alert will now appear sooner than normal regardless of the time delay option setting. - Added an option to page 5 of the customization menu which will allow the scout drone's altitude to be maintained while it is flying on a waypoint. This will allow you to keep tighter control of the drone's position. - Enemy islands overview window now has a banded background to improve readability (requested by Rob04). - Added configuration presets to the unit equipment window. You can save up to 8 fittings wor walruses and 8 for mantas, allowing you to quickly switch between your chosen setups. The only slight downside, depending on your point of view, is that weapons are reloaded instantly when you select a preset. - Added an overview window to the map screen which will show the following information about the nearest enemy islands: defense level, what mission the island has, whether it is in fuel range and whether it will become connected to your islands. You can also immediately set sail to one of the islands by clicking on the information and clicking the Instant Sail button. You can move the window to any location on the map screen by dragging its title bar. There are customization options for this function so you can choose whether it only displays when the right mouse button is held down or will also display upon contact with the mouse pointer, and you can choose the number of islands to display between 3 and 10. - Added an auto-hook function for mantas. With the auto-hook enabled, mantas under manual control will automatically hook onto any walrus when the manta is close enough. There is a customization option for this so you can choose whether to have the function fully enabled or individually enabled or disabled for each manta via command bar buttons. - When a walrus is being carried by a manta using a hook, the hook icon of the carrying manta will now indicate which walrus is being carried. - Added a rear-facing camera angle for mantas and walruses. There is a customization option so you can choose which key to use for this (feature requested by Rob04). - Added a navigational enhancement function for walruses which will force non-selected walruses to re-calculate their waypoints at set intervals. Do not expect this to be a magic fix for walruses as the underlying pathfinding is unchanged, but this can allow walruses to find better routes and avoid becoming stuck in some situations. The downside of using this function is that it prevents walruses from being able to auto-hack buildings from the map. They will still travel to the building, but you will have to hack it again when they arrive. There is a customization option for this function so you can disable it or select the time interval at which it works. Note: This function is experimental and any feedback on whether you think it makes an improvement would be appreciated. - Added individual fuel level readouts to each command bar button. You can choose between a vertical bar display or a percentage readout, or you can have both if you want. There are customization options for both displays so you can choose to have them always displayed or only when the fuel falls below a certain level. - Fixed a crash which would occur if manual timewarp was de-activated while the scout drone was in the process of docking (thanks to faber42 for reporting). - Fixed a problem where guns you did not already have onboard the carrier would sometimes be given for free on arrival at an island (thanks to Rob04 for reporting). 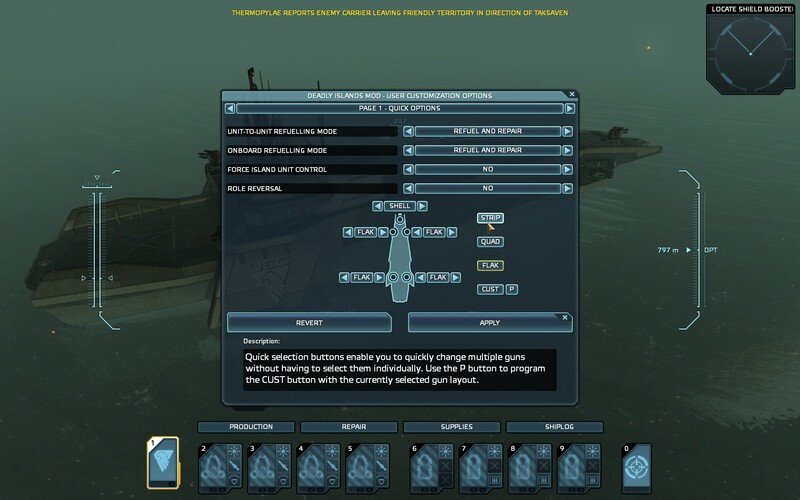 - Fixed a situation where if you are performing unit-to-unit refuel or repair at the same time as the walrus is auto-refuelling at an island fuel station, the activation and de-activation sounds would repeatedly play as the walrus fuel level goes above and below the minimum threshold setting. - Fixed a rare situation where if the carrier is heavily damaged and has low fuel at the same time as a repair is being performed while refuelling at a pier, the low fuel warning would repeatedly play. - Fixed a rare problem which could sometimes cause the speeds of certain functions to be incorrect for a few seconds after exiting manual timewarp. - When using the position holding function on mantas, the height of the manta will now also be held. This will prevent the manta climbing into a vulnerable position if you place it in a safe position and then switch to another unit, even if the manta is in offensive or dynamic stance. An exception is when two or more mantas are in the same location, in which case they still need to be able to move vertically for stacking. - Customization menu pages can now be selected by pull-down menu which will appear when you click on the bar which contains the current page title. You can still also switch between pages by clicking the left and right arrows. - Customization menu can now be moved to any position on the screen by dragging its title bar. - Previously the unit-to-unit repair and walrus self-repair level settings would be ignored if the fuel level was high, so that full repairs and refuelling could be carried out by a walrus at an island fuel station without the need to change settings. However, this would also happen when the walrus was not near a fuel station and could create the impression that the level settings are not working, so this will now only happen if the walrus is also in range of a fuel station which has been activated for automatic refuelling (thanks to nicoman for highlighting). - Trying to use the quick waypoint function on a walrus which is being carried on a hook will now give the waypoint to the carrying manta instead. - When the scout drone is active and has been selected at least once, the health display in the tactical carrier systems (0 key) icon will show the health of the drone instead of the health of the carrier, which is already displayed in the main carrier icon anyway. If you have both fuel management system and vertical fuel display bars enabled, the fuel level of the scout drone will also be displayed in the tactical systems icon. - When fuel management system is enabled, the carrier will now correctly use fuel when being manually controlled, which it does not do in the unmodded game. ---Added function for a unit to be quickly given a waypoint to another unit's current location (primary function), or an order to assist that other unit (secondary function) without needing to enter the map. To do this, hold down the number key of the unit you want to give the order to and then either tap (for primary function) or briefly hold (for secondary function) the number key of the unit you want it to move to or assist. A beep will indicate when secondary function has been activated. If you want to reverse the primary and secondary functions, disable secondary functions, or disable this function altogether, there is an option on page 4 of the customization menu. -Sometimes, depending on the target unit's location, a waypoint will not be possible, for example trying to send a walrus to the location of a manta which is in an area not accessible by walruses. In these cases, the "program completed" message will immediately play. -Walruses can only assist other walruses. Trying to make a walrus assist a manta will always use waypoint mode instead, regardless of mode selection. -In waypoint mode, the waypoints are only set to the target unit's current location at the time the waypoint is set. The target unit can then be moved without affecting the waypoint. This makes it possible to switch the positions of two units by quickly giving them waypoints to each other. ---When using the timed autosave function, when a save is due it will not take place until the next time you switch between units. This makes the saves less intrusive and they do not break the immersion when in combat. ---Compatibility updates for CCGM beta 1.07.0025 which is now required. ---Added options for FOV (field of view). 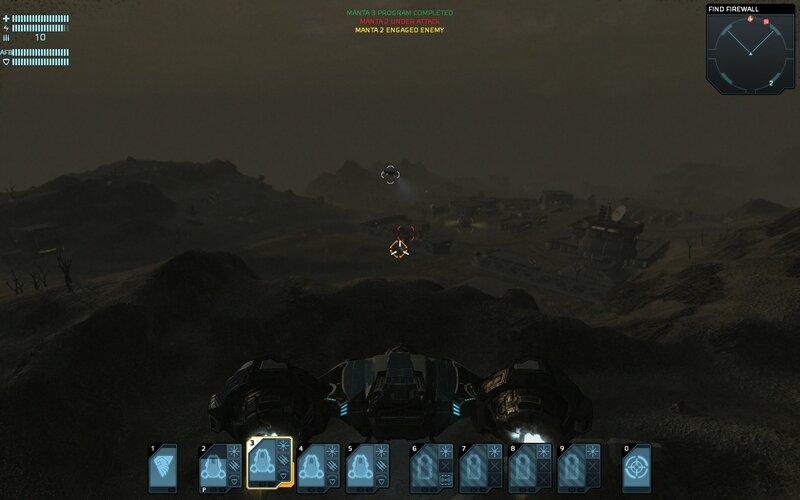 The first option controls the normal FOV and can be set between the game's standard 60 degrees anywhere up to 120 degrees. The second option controls the maximum FOV. When your vehicle is moving, the field of view will gradually expand up to this value. When the vehicle slows, it will return to normal. Note: Either of these options can be disabled by setting them to 60. For weapons with zoom functions to work properly, it is essential that the zoom key in the customization menu matches that in the main options menu. For views that do not have a zoom function, the zoom key can be used to toggle the FOV on and off. This is useful for mantas when you may want to have a short period of close quarters combat with the standard field of view. ---All keys used for the mod's functions can now be individually set in the new Key Bindings page in the customization menu. ---Scout drone can now dock on autopilot by pressing the dock key. This replaces the auto dock method which was previously used (feature requested by faber42). ---Added new hotkey option for generating a quick auto-save. This function is similar to the F5 quick save, with the major difference that these saves are visible in the saved games list and are resumable after a crash, and so they offer protection from crashes that the normal quick saves do not. ---Added option for timed autosaves. This interval can be set to anything between 1 and 20 minutes. ---Added warnings for the carrier's fuel level. ---Added fix for a rare glitch in the game which causes units to fall out of the map and become trapped inside the island's terrain. -Fixed jerky appearance of carrier when viewed from the new camera angle introduced in v1.19. -Scout drone will not automatically dock unless it has left the docking area at least once since benig selected after launch. This will allow you do launch the scout drone and keep it in the area of the carrier without it accidentally docking. -Walruses which become stuck will call for manual assistance by having their command bar icons flash with a display of how long they have been stuck. Additional verbal and text warnings will be given if no action is taken. There is a customization option allowing you to choose how long a walrus must be stuck before the alert starts. If you prefer not to have the additional verbal and text alerts, there is also a command bar only option. Note that false alarms can occur if you sent multiple walruses to the same point, or send them to hack a building using the map. -New item: Refuelling pod for walruses. The pod carries a small amount of fuel which can be transferred to any unit which has less than 75% fuel. To activate the pod, drive as close to the target unit as possible, switch weapon to the fuel pod and press the left mouse button. An equipped walrus can use its own fuel pod, but only if it is completely out of fuel. -Walruses which are out of fuel will no longer slowly progress to their destination. With the addition of the refuelling pod and unit-to-unit refuelling function, there are now enough ways to refuel a stranded walrus. -Added an alternate camera angle to the main carrier view which can be toggled by pressing the left Alt key when the carrier is selected. This camera is an outward view from the control tower and features the same two-stage telephoto zoom as the scout drone's alternate camera. Zoom is toggled with the Tab key. The Q and Z keys allow the view to be quickly aligned to the front or rear of the carrier. There is a customization option for this camera, allowing you to select whether it is locked or unlocked from the carrier's rotation (feature requested by Rob04). -Scout drone alternate camera can now be controlled using the mouse. If you prefer not to have mouse control of this camera, there is a customization option allowing it to be disabled. -Once the scout drone has been selected normally, the bottom part of the carrier offensive systems icon will become a shortcut to the scout drone. An additional shortcut via the "-" key will also be available. This will make it easier to use the scout drone to see where your carrier weapons are hitting. -When fuel management system is enabled, the scout drone will now use fuel. There is enough fuel for around 10 minutes of continuous flight, or 20 minutes of idling. The drone will be fully recharged when it docks (feature requested by Rob04). -The neutral island turrets customization option has been expanded to allow you to choose the difficulty of turrets used. The configuration used in previous versions is called "classic" (feature requested by quiet_man). -Units which have completely run out of fuel or have gone too far out of range will have an option to abandon them when they are selected. This may be useful if you would prefer to lose the unit rather than rescue it, for example if you have a plentiful supply of replacements but cannot use them because the stranded unit is in their slot. -Added a customization option which allows you to increase the range at which you can refuel at an island's pier. Default is zero but you can use this if you find it difficult to get close enough to a pier. - Walruses can now refuel automatically when in proximity to a refuelling station. The station needs to have this activated first by pointing to it on the map in the same way as piers for carrier refuelling. Fuel management system must be enabled and the walrus must be stationary. Refuelling will be slower than if the pump was manually activated, but all nearby walruses can refuel at the same time. This will mostly be useful when using walruses to refuel and repair mantas while on an island, as there is no need to manually refuel the walruses every time. - When using the V key to clear unit waypoints, if multiple units are selected, they will now all have their waypoints cleared instead of just the current unit. - When manually controlling the scout drone within the docking area of the carrier, you can now press G to instantly dock the drone (feature requested by Rob04). 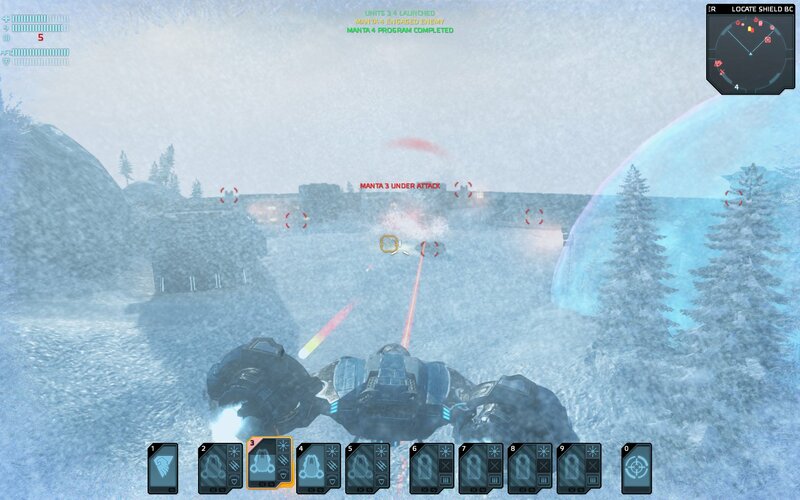 - Mantas fitted with the new laser mkII were not firing at enemies while under AI control. This has now been fixed (thanks to solrac42 for reporting this). - To allow more flexible fitting of walruses, the following items will now fit in slot 2 instead of 3: Ammo box, scanner, hack capsule, prod capsule defense capsule and resource capsule. This will allow the shield to be used at the same time as these items. - The Strip button on the customization menu now toggles between stripping all weapons and putting them all back. There is now also a hotkey to this function by pressing F10. This allows you to quickly stop the carrier from attacking if it is hitting something you do not want to destroy. - Added fix for a bug in CCGM which causes a manta's flare launcher to be lost if you dock after it has run out of flares. If the supply barque gets stuck near your position, items will automatically be transferred to the carrier, so you do not have to move to intercept the barque. Multiple guns for the same carrier position can now be sent on a single barque without losing items. When at the stockpile island, any carrier guns on the stockpile will automatically be transferred to carrier storage ready for use. When sending more fuel to the carrier than required, any excess fuel will be returned to the barque instead of being lost. As much as possible will be returned as "fuel pack" items, smaller leftover amounts will be returned as "fuel" items. - This is just a compatibility update to include changes introduced in the CCGM 1.07.0023 beta. If you are still running CCGM 1.06, you should use v1.15 of the mod instead. -Position Holding option for each unit prevents units from moving out of position when they are not following a waypoint and are not being manually controlled. Units will still be able to change altitude and can still turn and engage targets from their held position (requested by quiet_man). -Dynamic Stance option is available for each unit which has Position Holding enabled. This will allow units to be kept in offensive stance at all times when not following a waypoint and automatically switch to defensive stance when following a waypoint. This allows units to be in offensive stance without wandering into heavily defended areas without your control, as well as being able to move to waypoints without deviating from their plan due to nearby targets. Note that manual stance changes will be ignored while this option is enabled. 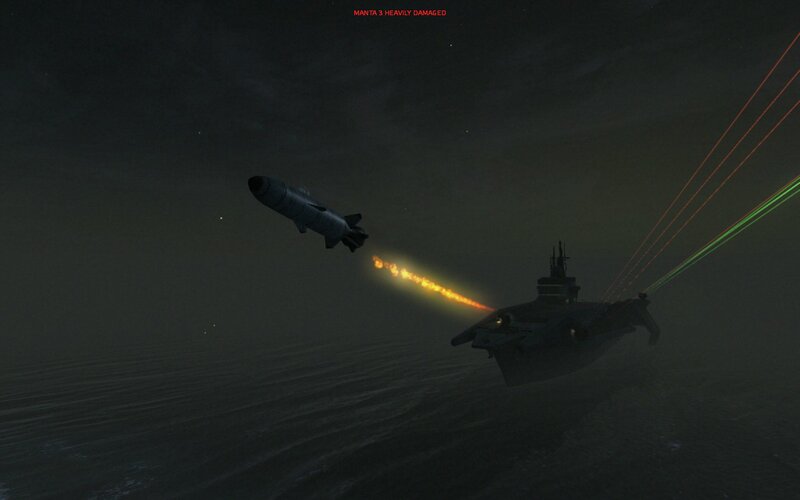 -EM flares can be used against the enemy carrier when it is in range. These emit an electromagnetic pulse which will disable one of three enemy carrier controls for a short time: its own engines, control of mantas or control of walruses. One flare can be active against each of these targets at a time. The targets will still be able to fire, but will not be able to move. You can use this to your advantage, either to escape or to move to a better position. This uses carrier flares which can be constructed at the stockpile island. -Weather intensity can be set to either clear conditions, maximum severity, or a random severity. This will be useful for players who do not like to play in severe weather. -Scout drone secondary camera angle (accessed by pressing C) now has a two-stage telephoto zoom which can be toggled using the tab key (requested by Rob04). -Downward-facing camera angle for mantas is now toggled by pressing left alt key instead of requiring it to be held (requested by Rob04). Also improved the camera angle when the manta is fitted with a hook. -Unit-to-unit and onboard refuelling options will now be saved between sessions with the rest of the options. -Pier refuelling distances have been slightly increased, and now have sounds indicating refuelling has started or stopped (requested by faber42). -Compatibility changes to allow the mod to be run at the same time as the latest version of Nemesis mod using Azrapse's mod mixer. If you choose to do this, you should remember that games saved with Nemesis running cannot be resumed without it, and the same is true for the mixed mod. Thanks to Gnrl_Grad for working with me to get both mods working together. -Fixed an issue in CC:GM which causes damage effects to be missing from both carriers after the loading screen when you arrive with damage at an island. -Fixed an issue in CC:GM which causes units in offensive stance to ignore the dock command and instead wander off to engage other targets. Units will automatically be taken out of offensive stance when the dock command is issued. -Fixed an issue in CC:GM which causes the carrier rotation to snap to a different angle when setting a waypoint after manually controlling the carrier (thanks to Gnrl_Grad for working on this). -Fixed an issue in CC:GM which causes units not to execute waypoints when the unit has been manually controlled. Any unit which goes from not having a waypoint to having a waypoint will now have the waypoint executed automatically. -Several smaller fixes and tweaks. - Customization options can now be set via in-game menu. Default access to the menu is either the F12 key or the Deadly Islands button on the map screen, but you can choose to have one or both of these methods. The forcing of island unit control (previously by pressing the F12 key) is now an item on the Quick Options menu page, as is unit-to-unit refuelling mode, which was previously done by double tapping the K key. Clicking apply on the menu will save the options to disk and they will be loaded the next time you start the game. This removes the need to edit the ccgame.c file, which now only sets the defaults in case the config file fails to load. Note, the first time you run the mod, you will get a message about the config file not being found. This will not happen after the first time you apply menu changes. - Carrier deck guns can now be individually configured on the Quick Options menu page. When a gun is delivered to the carrier, it will now be placed in carrier storage for quick switching later. Any guns you already have on the carrier before running the mod will be removed from the deck and placed into carrier storage for you automatically. A couple of notes about this feature: When delivering guns by barque, do not attempt to deliver two guns for the same position at the same time, e.g shell and plasma, or one will be lost. The addition of this function does mean that ammo is effectively unlimited by switching weapons. If you strip all guns from the carrier while a gun is selected, a graphical glitch will occur until you switch views. - When you have five guns on the carrier, the mod will automatically correct a problem in the game which sometimes prevents the AI from firing guns. Not saying this is perfect, as there are still some limits of the AI regarding the angles at which it will fire the guns, but having five guns should give you a big improvement to the chances of the guns firing. The enemy carrier will also have this fix if it has five guns. - Deck guns have had their angle limits adjusted for improved targetting ability. The front cannon can now turn to almost 90 degrees. Be careful when using flaks in the front positions, as the increased angles make it possible to fire into the water behind you, which can cause damage. If you prefer not to have this change, just delete the db folder from the deadlyislands folder. - Additional messages for the supply barque when it arrives back at the stockpile island, or becomes stuck near to your location (feature request by Amadeus75). 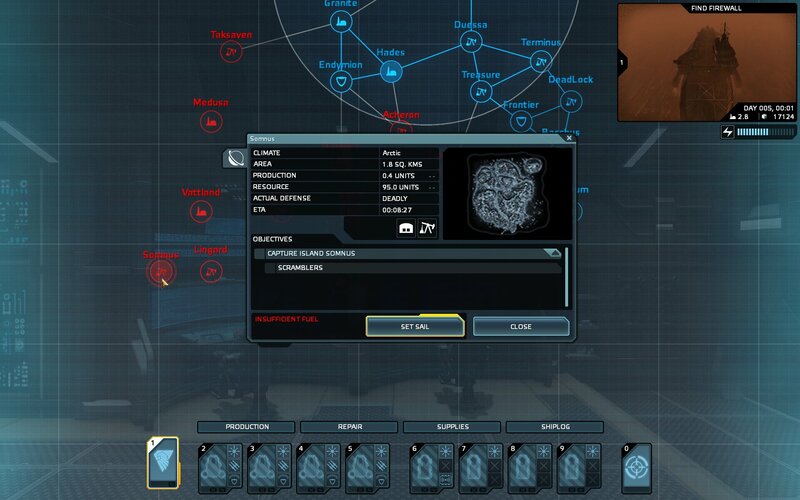 - Additional bonus blueprint can now be unlocked at islands which have a research facility. To get the bonus, drive one of your carrier walruses as close to the building as possible and point to it on the map. Of course, there is no guarantee it has a blueprint you don't already have, and you will be told if this is the case. I noticed that sometimes the research icon is not visible while the island is still enemy controlled, so you can do this before or after capturing the island. Due to the addition of this feature, the default setting for unlocking all blueprints has been increased to 100% of islands (feature request by Megaheat). - Added option for onboard refuelling mode. Similar to the unit-to-unit refuelling mode selection, this allows you to disable refuelling and/or repairing of units docked at the carrier when the fuel management system is active. - Added option to toggle the main HUD elements on and off with the F11 key. There are two options for this: Hold and Toggle. By default this is set to Hold, as this is most useful when you only want to take a quick screenshot without the HUD. - Added options to remove the animated bridge crew background and scrolling lines from the map screen. This can give a big performace boost on the map screen as well as making it clearer. These options are disabled by default. - Added option to have waypoint markers flashing for higher visibility when controlling units. This option is disabled by default, as it will probably only be used by a minority of players, for example if you have poor vision or you just find difficulty locating waypoints against terrain. - Added an enemy carrier exclusion zone option. With this option enabled, the enemy carrier will not be allowed in range of your carrier. This may be useful for players who find they cannot continue past a certain point in the game due to the enemy carrier, or if you just prefer to play a game with no carrier battles. This option is disabled by default. - Added a role reversal option. When this option is confirmed, you will switch progress and location with the enemy carrier. This may be useful when you are about to finish a game but want to play on without starting from scratch. For obvious reasons, this option is for strategy mode only, and will not work in campaign mode. - Added a straight-down camera angle for mantas by holding the left ALT key. This is useful for aiming bombs and torpedoes (feature request by Rob04). - Fixed an issue I noticed since the last CCGM beta that would sometimes cause a manta to explode when trying to refuel it from empty with a walrus. -Refuelling or repairing units onboard the carrier will cost carrier fuel. Each unit carries the equivalent of 2.5% of the carrier's fuel, and repairs cost double this amount. 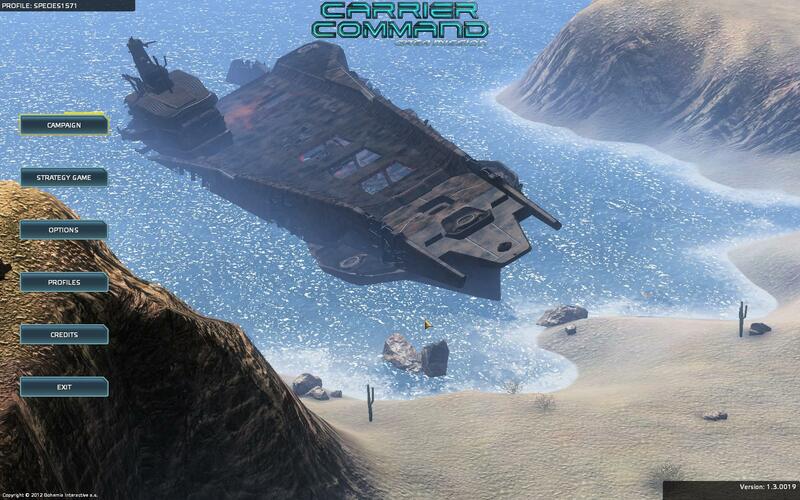 If the carrier's fuel falls below a customizable level (default is 20%), units cannot be refuelled or repaired. -The carrier can be refuelled at any non-neutral island's pier. To refuel the carrier, move the front of the carrier as close as possible to the end of the pier. The pier must also be activated before refuelling is possible. This is done by simply pointing to the pier on the map. This will also display the progress of any refuelling that is in progress. Refuelling is a slow process, refuelling from empty to full will take 30 minutes, and you cannot cheat by using timewarp. -New units being delivered from storage will only contain minimal fuel, the rest will need to be supplied by the carrier. There is a customization option for this, so you can opt out of this if you prefer. -When carrier fuel is too low to refuel docked units, they will start transferring fuel to each other to achieve equal fuel levels. There is a customization option for this. -If the carrier runs out of fuel, it can continue sailing by taking an equal amount of fuel from all docked units. It will never put a unit below 20% fuel, so units will still have enough fuel to defend if needed. There is also a customization option for this. -When using the manta simple docking option, mantas will now return to the carrier at the correct speed for their armor level. If you prefer all mantas to return to the carrier at unarmored speed, there is a customization option for this. Mantas will now also climb a bit higher when close to a shielded command center to reduce the chance of hitting the shield. -Early warning system reminders will now state if the island is under attack. -If the enemy stops attacking one of your islands, a notification will appear. -Compatibility remains for the 1.06.0004 beta as well as the recent 1.06.0011 update. - Island unit control will not become enabled if any of your islands are changing type or your stockpile is moving. If you are at a friendly island and you are sure your current island is not changing, you can now manually enable unit control by pressing F12. - Message log will not fill up with "New achievement" messages when using timewarp at a friendly island. - Mantas now have the ability to fly in a straight line to the carrier when the dock command is issued. This avoids mantas taking some strange routes and flying around the island and into danger when docking. With this option enabled, the mod will now also control the landing of mantas on the deck, as the AI is often very slow at doing this. If a manta receives damage while on its way to the carrier, and it has over 20% fuel, it will enter overdrive for 5 seconds, during which it will burn a significant amount of fuel to give it a boost of thrust. Overdrive can be disabled in the customization options if you prefer not to have it. - Alternate camera angles for docked units, with additional camera angles for a wider view of the hangar when multiple units are selected at the same time. Additional camera angles for mantas landing on the deck. - Scout drone can now be manually controlled using the W/A/S/D/Q/Z keys. - Scout drone now has an additional camera angle which can be toggled by pressing C while viewing the drone camera. This camera can be controlled independently of the drone's movement by pressing the W/A/S/D keys. The Q/Z keys will align the camera to the front or rear of the drone (feature requested by forum member Rob04). - Units will not be immediately destroyed when abandoning them to go to another island. Instead, they will be destroyed when you arrive at the other island. This gives you the chance to change your mind and go back for them if you haven't gone too far, and they haven't been out of telemetry for too long. 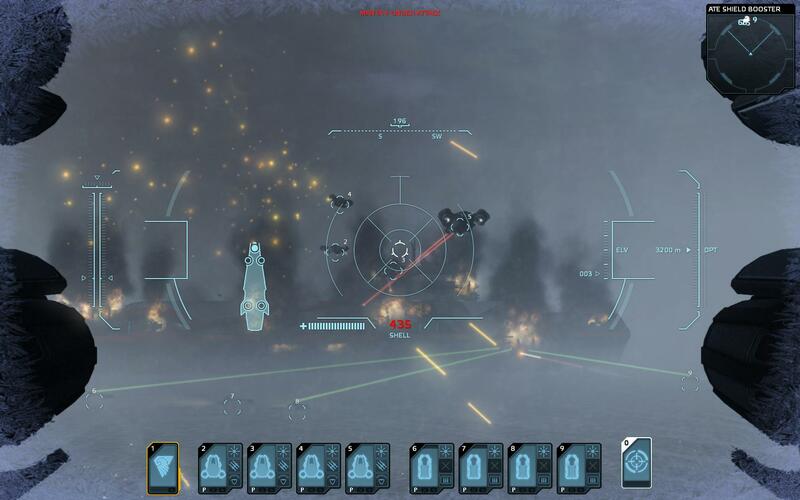 - Mod functions which were previously only available in the strategy game are now also available in the campaign, with the exception of enemy carrier respawn, which is still only available in the strategy game. - Mantas can now successfully dock on autopilot when the carrier is moving. - Island units on friendly islands can now be controlled by clicking on them on the map. Island units have infinite fuel but not infinite health or ammo. If you find that units cannot be selected, enter manual timewarp for a couple of seconds and this should make them available. Units should always be controllable when the enemy carrier is present. This means that when you arrive at an island under attack, you can jump straight into defending your island before your carrier units arrive. - When using unit-to-unit refuelling or repairing, or walrus self-repair, customization settings will now be ignored if the walrus has had a near-full fuel tank in the last 30 seconds. This means you can now fully repair and refuel mantas on an island by using a walrus at a refuelling station. Also, mantas and walruses will no longer refuel or repair if the walrus is being carried on a hook. - Early Warning System and Long Range Surveillance now require the control tower to be repaired to at least 95% in order to receive messages. A warning will be displayed if a message has been missed. - The two carriers will no longer be able to run through each other during battle. - Added a warning when the carrier is detected drifting sideways. You should rarely see this other than when you sail too close to an island and get propelled away. - Slightly increased the minimum time before an enemy carrier respawn is possible. - Added the ability for unit-to-unit refuelling and repair. Mantas can refuel/repair walruses and walruses can refuel/repair mantas. To refuel and/or repair a unit, hover the manta over the walrus until you hear the activation sound. There may be times when you wish to either only refuel or only repair a unit, so there is a mode selection which can be changed by double-tapping the K key. There are customization options to allow you to configure what fuel levels are required for refuelling and repairing to be possible. Note that when refuelling a unit, there is a 10% spillage factor for any fuel transferred. Repairing a unit has double the fuel cost compared to refuelling, so repairing a unit by 10% will cost 20% of the other unit's fuel, and you cannot repair a unit while it is completely out of fuel. To allow mantas to be refuelled, they will no longer automatically self-destruct when out of fuel. Instead, they will receive 95% damage and remain invincible until they get their first drop of fuel. - Added ability for walruses to self-repair up to a configurable level at the expense of fuel. Again, the fuel cost will be double the amount of the repair amount. This is intended to avoid walruses getting into a critical repair level where one stray bullet will destroy them, so walruses will not care how much fuel they have to use to get to their target repair level. Walrus self-repair will be 4 times slower than getting the repair from a manta, and a beeping sound will indicate when a walrus is self-repairing. - Added two customization options to allow finer control of how the mod increases island defence ratings (feature requested by forum member atroublestarter). The first option is the number of levels of defence rating an island receives when the increase is applied. For example, a setting of 1 will increase weak islands to normal, strong to very strong and very strong to deadly. A setting of 5 makes all islands deadly. The other option allows the mod's turret setup only to be used on islands over a certain defence rating, otherwise un-modded turrets will be used. The defaults of these options will cause the same behaviour as previous versions of the mod. - Fixed an issue that would cause enemy carrier respawning not to properly disable when the correct customization option was set (thanks to Rob04 for reporting this). - Fixed an issue that would cause the game to crash when loading a saved game in which the enemy carrier had already been destroyed without the mod running. - Fixed an error that would cause the long range surveillance upgrade to repeatedly enable and disable under certain circumstances (thanks to atroublestarter for reporting this). - Fixed a situation where enemy carrier units would appear (sometimes invisibly) at an island even when the enemy carrier was not there, and fire effects being left behind on some islands (not centain that this was mod related). - Fixed a random (about 1 in 60) chance that a crash would occur when loading from one game to another if a unit which existed in the first game did not exist in the loaded game. Compatibility remains for the 1.05.0026 beta as well as the recent 1.05 update. - Scout drone can now be docked back to the carrier. To dock the drone, simply send it back to a spot next to the carrier. The drone camera must have been selected at least once since the drone was launched, and it will not dock until the drone camera has NOT been viewed for 10 seconds. This is to allow the drone to get clear of the docking area after launch, and also prevents the drone from docking while it is selected. A warning will now also appear when the drone is being left behind (as long as the drone camera has been viewed since launch). - Included a fix for a bug in CCGM where loading a saved game while in timewarp would cause the game to crash. The first option controls how likely it is that the enemy carrier will respawn at each opportunity. Default is 30%. Setting this lower does not guarantee that the enemy carrier will not respawn at the first opportunity, it just makes it less likely. The second option controls the maximum lead the enemy may have before respawn is possible. This gives you some incentive to destroy the enemy carrier, as you can gain some time before respawn. Default is 8 islands. If you want respawns only after you have fully caught up, set this to 0. The third option is the minimum number of islands you must own before respawn is possible. Default is 4. 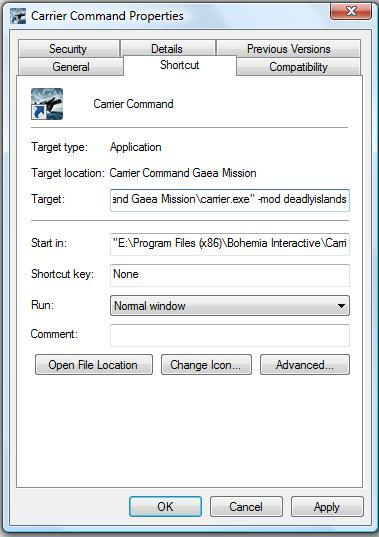 Note that this may be applied to a save game in which the enemy carrier has already been destroyed without the mod, but in this case the respawned carrier will not appear on the map, so it is best to start a new game or resume from a save game with the enemy carrier still alive. - When controlling the carrier deck guns, the gun selection display is now in a more helpful location next to the target reticle instead of the top left corner. This lets you keep your eyes focused on what you are shooting at without having to look too far away to see which gun is selected. If you prefer not to have this change, just delete the file hud_turret_carrier.layout from the deadlyislands/gui folder. - Added a two-stage upgrade to friendly radar stations. The first stage upgrades all friendly islands with an early warning system which will alert you whenever the enemy carrier enters their territorial waters. By default, this upgrade requires you to control 15% of the islands (5 islands). The second stage upgrades your radar network with long-range surveillance which will report the enemy carrier's movements among his own islands. Radar stations need to form a chain for this upgrade. By default, 60% (20 islands) must have a connection to your stockpile island. If your island chain becomes broken or you lose your stockpile, the upgrade will be lost until you restore it. If the enemy carrier remains at the same location, reminders will be given at set intervals, default is 10 minutes. - Changed the customization option for upgrading enemy island defense ratings. Instead of an on/off option, this is now a percentage of islands you can own before the upgrades are applied. This way, if you prefer an easier start to the game, you can adjust this to your preference. Default is 10% (4 islands). - Added option to have neutral islands contain defensive turrets to give you some challenge instead of getting easy islands. This will only happen once the enemy island defense upgrade has been reached. - Added option so that if you arrive at a friendly island and the enemy carrier is already present, the island will not have any turrets. This prevents enemy units from immediately being destroyed and allows you to attack them yourself, as well as giveing the effect that the enemy has already destroyed the island's turrets. - Added option which enables the radial menu dock and undock commands to be applied only to units of the same type unless selected. For example, you may be using mantas to fight while walruses are standing by and wish to quickly dock all mantas without docking the walruses. Using the radial menu while the deck guns or the carrier are selected will apply to all units as normal. - Added option to display a reminder that the enemy carrier has already been destroyed. This will only be displayed when you arrive at an island or load a game where the carrier has been destroyed, and is mainly to save you from sailing around, hunting for the enemy carrier. - Customization options added for items which did not previously have options: Skipping of advice about island missions when arriving at an island, advice about fighting in bad weather or setting course to a strong island, and whether units will automatically resume program when switching between units. - Enemy aggression towards your islands will now be partly dependant upon the balance of power in the game. If the enemy has more islands than you, he will relax more and take longer to capture your islands. If you have more than him, he will become more aggressive in capturing your islands. This should help you to avoid being overwhelmed early in the game, and make it a little more challenging for you to win towards the end. - Added authenticity from the original Carrier Command with island-specific alerts when an island changes ownership. For example "Thermopylae is now an enemy island", "Vulcan is now a free island", "Deadlock is now a friendly island" etc. 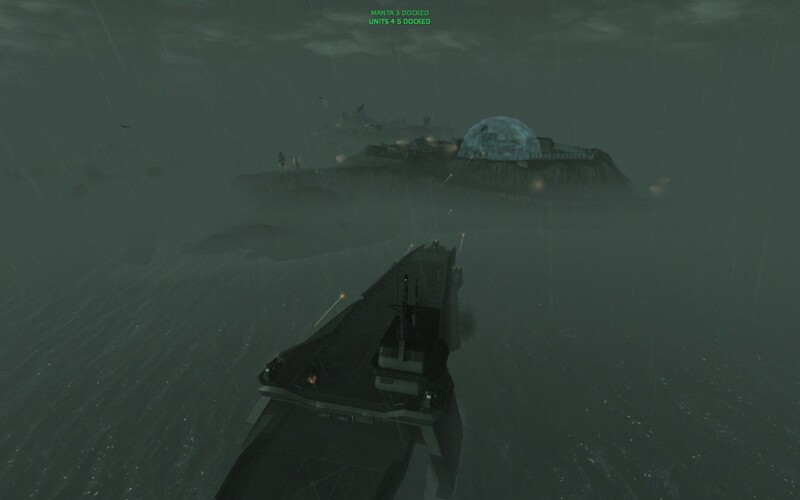 - A running total of friendly vs. enemy islands will also appear whenever an island changes ownership. - The location of your stockpile and island connections to the stockpile are also monitored and you will be alerted when the stockpile is moved or when there is no stockpile island, or if islands have become disconnected from the stockpile. If too many islands become disconnected, you will be advised to relocate the stockpile. - A notification will also be displayed when an island conversion has completed, for example "Taksaven conversion from mining to defense completed". - The mod is now fully configurable and you may opt out of any of the mod's functions. To do this, load ccgame.c into Notepad, locate the section at the top marked "user customization options" and change the relevant options from 1 to 0. - Updated for CCGM beta version 1.05.0004. Starting with minimum Tech level would have made progressing in the game impossible, so the mod will now give some leeway until you have a few friendly islands (only when the game was started with minimum tech). For this reason, if you choose to start with minimum tech, I recommend that you also start with minimum UEC islands. Starting with more friendly islands is a very bad idea. 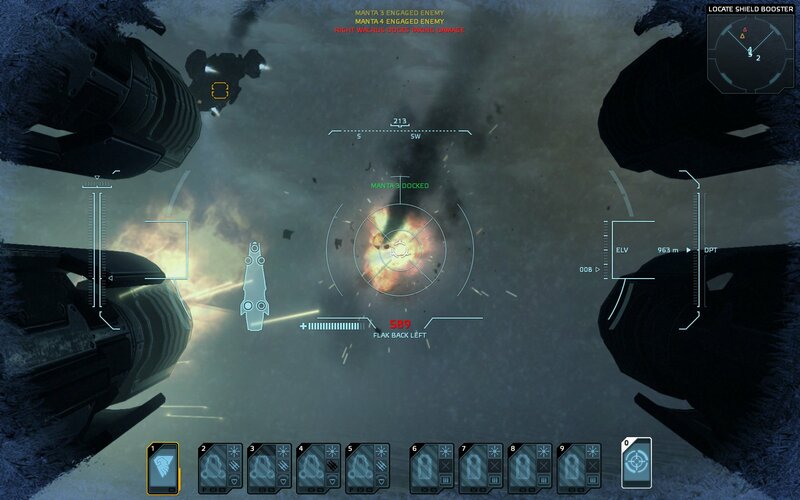 - This update adds HUD displays for shield and afterburner levels to the exterior view of mantas and walruses. Also changes to the main menu allowing you to see the background graphics better. - The mod will now disable messages on arrival at islands with firewalls etc. and arguments whether we should fight in bad weather. Jebuus man! Your're making this game the way it should have been from the start O_O. If I was a dev i would feel really bad just by reading your changelog.